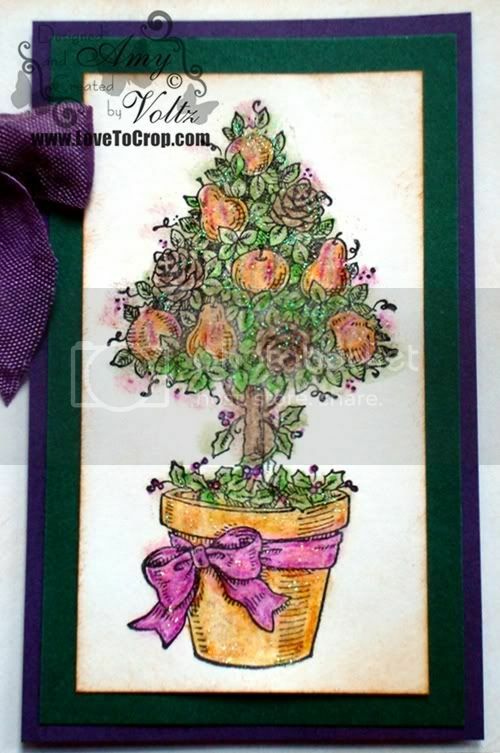 For my project I created a card with an oldie but goodie stamp set that I found hiding in my stash of stamps... If ya know the name of the set, be sure to let me know so that I can update my post (I know it's retired from SU!, but I don't have the name of the set)!! Judging from the cleanliness of the pear tree stamp, I'm thinking that I have never before used this stamp... (Um, why not???) I love how elegant the stamp is -- It goes with the crinkle ribbon from My Craft Spot so nicely too!! I hope you've enjoyed my card -- For even more inspiration, please be sure and visit CTO to see all of the WONDERFUL projects my DT sisters have created!! I hope you'll be inspired to create something to share in the Christmas In July challenge over at Celebrate The Occasion!! *** It's also time for the DT Call over at CTO!! Be sure to hop on over there for all the details on how to apply for the next Design Team!! I absolutely LOVE working with everyone at Celebrate The Occasion... It's such a wonderful and inspiring group of gals -- So if you've been thinking about applying, why not give it a shot? This card is great! I love it and not to come off as "bah humbug", I'm just not a Christmas person lol. I love to see my boys open their gifts and spend time with them explaining why we have Christmas, but the actual decorating for Christmas... I am the WORST at doing it. Halloween on the other hand... GOT IT IN THE BAG, that is my time to shine and deck out the house in scary spidery fun! So to say the least this will be a challenge for me. Thankfully it's a no red challenge. This card has truly inspired me, thank you! I love the colors in your card!! Amy this card is beautiful! You did an awesome job with the coloring. What is the brand and type of watercolor pencils did you use? Great card by the way lov ethe colors. Great card, Amy! I'm so glad you commented on my post so I could find YOURS! I'm going to head over to CTO now. Thanks! Beautiful. 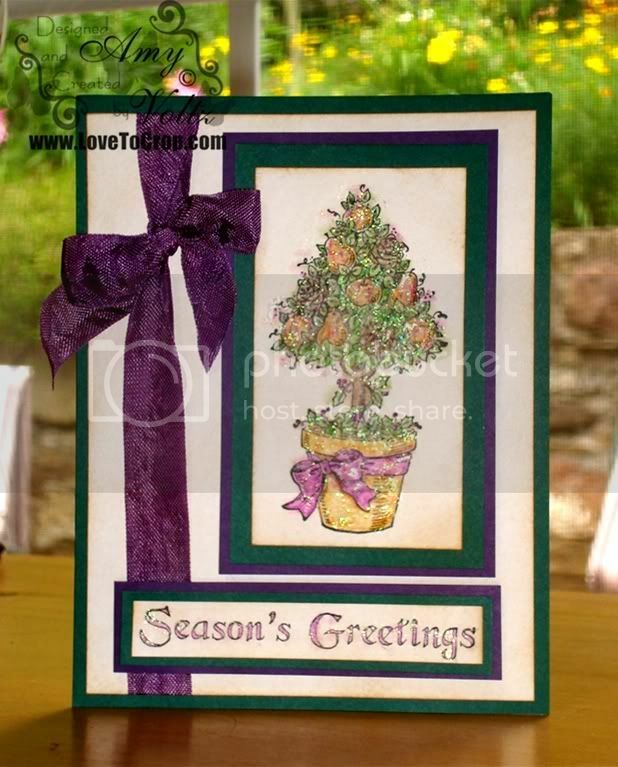 I love the use of purple with the card! I love, love the crinkly ribbon! I bought some recently and need more, lol!! Love this elegant card! The colours are great and that ribbon is wonderful! Very pretty, loving all the glitter, it really makes it pop! This is beautiful, I love how the tree turned out, fabulous job on the coloring! This is just so pretty! I love the ribbon and the image is gorgeous! Fantastic job! Amy, this is GORGEOUS! Wow, you do an amazing job coloring! I color like a third grader and can't stay in the lines :P And I love the bow! This is so elegant and classy and just beautiful! And oh my gosh, you make me laugh! I love reading your posts :) I hope you have a wonderful day! !